No idea where to start on your essay? Confused by citations? Plagued by run-on sentences? The Writing Center has what you need! The Writing Center can help students with any writing assignment for any class, whether it's a summary of a reading for History, a lab report for Biology, a personal response for Psychology, or a full essay for Composition. We can also provide support on resumes, cover letters, personal statements, or scholarship essays. Come by at any stage in the writing process from brainstorming ideas to editing the final draft. Through both appointments and walk-ins, we offer traditional one-on-one tutoring appointments for 25 minutes with faculty and peer tutors. Just want to ask a couple questions? No problem! You can also come work on your own in the computer lab and ask questions as you write. 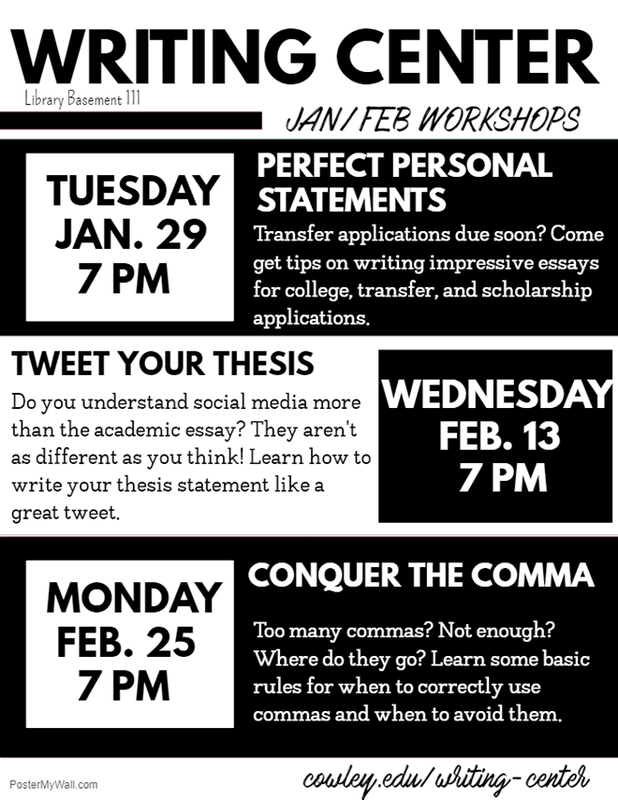 Lastly, we provide several group workshops throughout the semester on common writing issues like thesis statements, citations, and timed writing. At the Writing Center you can receive free support on any writing assignment for any class at any stage in the writing process. Appointments & Walk-Ins are welcome!